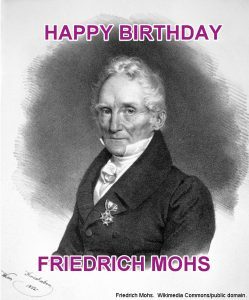 Mini Me Geology Blog » Happy Birthday Friedrich Mohs! Today is German Geologist Friedrich Mohs’ Birthday! Geologist Friedrich Mohs was born on January 29, 1773, in Gernrode, Germany. Born Carl Friedrich Christian Mohs, he was a geologist and mineralogist who during his career worked at a mine, as a mineralogist for a private collector, and as a geologist for a museum. During his career at the museum, Friedrich began to identify minerals using their physical properties. One of these physical properties was the hardness of a mineral, which led him to create the Mohs Scale of Mineral Hardness in 1812. Friedrich Mohs died on September 29, 1839, at the age of 66. 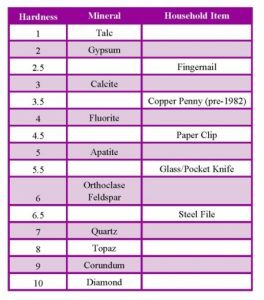 In this video we discuss how to use the Mohs Scale of Mineral Hardness with your own samples.